Now is the time to boost our immunity, particularly given recent predictions that this winter may see a severe flu epidemic. In addition to the usual dietary advice (more on this next month), there’s something very simple we can do – take advantage of these glorious autumn days and hit the woods. There’s a new word for spending time in the forest. It’s shinrin-yoku, a term coined in Japan that translates as forest bathing. Forest bathing has been enthusiastically adopted in California where it sometimes goes under the name of eco-therapy. As I and my troop of little Kale & Cocoas recently returned from a week hiking through the pine and beech forests of Bohemia in the Czech Republic, the health benefits of forest bathing (and walking) are currently front of mind. So would we have returned more refreshed and better rested from a beach or pool holiday? The answer is emphatically no. The Japanese practice of shinrin-yoku appears to lower the heart rate, lower blood pressure, cut the production of stress hormones like cortisol and boost the immune system. Why? Because when we walk among trees (particularly ever-green trees like pine and fir) we inhale phytoncides, essential oils found in wood, plants and some fruit and vegetables. Between 2004 and 2014, the Japanese Government spent 4 million dollars studying the impact of forest bathing. Studies from Japan’s Nippon Medical School found that phytoncides inhaled during one weekend of forest bathing had a marked effect on immunity that lasted a month, while a study from Chiba University found that people were better rested and less inclined to stress after a forest bath (which simply means time spent in a forest, you don’t need to do anything active although a good hike can only help). Another study found reduced levels of anger and depression and greater energy levels among those spending time in the woods, compared with time spent in the city. You can read about more studies into forest bathing at http://www.natureandforesttherapy.org/the-science.html. Or read our last post on the power of phytoncides here. San Francisco now has its own Forest Bathing Club that meets monthly to hang out in woodland, while California is host to certified forest bathing guides (yes, really!) who lead barefoot walks through local forests. After meeting a barefoot walker in the Bohemian wilds, my daughters and I had a stab at going without footwear. We can report that barefoot walking is indeed a pleasurable and soothing experience, but don’t expect to get anywhere quickly. If your rate of breathing hasn’t increased, you’re walking too slowly. Stay tall and pick up speed. When you get home you’ll want some food. 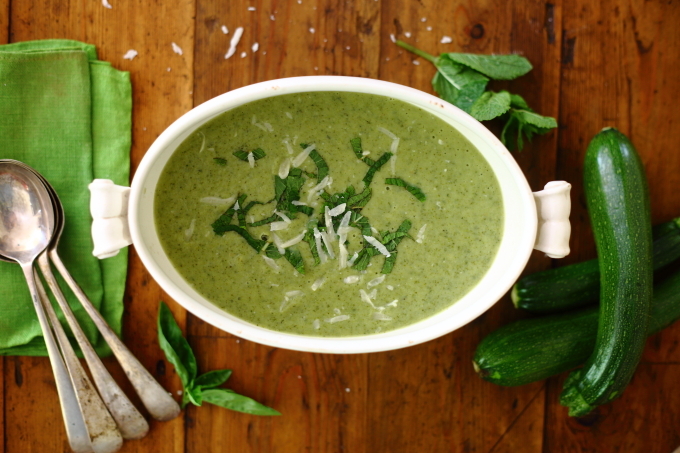 Use any last glut of courgettes/zucchinis to make this delicious soup, which is equally good served warm or cold. Saute the onion and courgettes/zucchinis in the oil for five minutes, until soft. Add the garlic and basil stalks, a teaspoon of sea salt, a grind of pepper and cook for a further two minutes. Add the ricotta, stock, mint and basil leaves (reserve a few to decorate). Bring to the boil, simmer for five minutes then blend until smooth. Add more salt if needed. Serve warm with parmesan, or cold with extra herbs and a drizzle of olive oil. PS Apologies to our US readers who have been putting up with our anglo-centric terms for quite long enough…following a recent email we shall be explaining words like courgette and rocket, and using the US word where we can! Another wonderful post. I am envious of your trip to the pine and beech forests of Bohemia. I am currently in Australia and wonder if anybody has done any research on the effect of eucalyptus forests on a person’s well-being. During warm weather, just after a rain, the smell is heavenly. I have been bush-walking (the term used here) several times after a light rain and it was wonderful. Not barefoot though – it’s not recommended because of snakes and prickles. There is no shortage of pine forests around here either, but beech doesn’t grow naturally (wild) here anymore. Thank you, Gaynor. I suspect Eucalyptus will offer similar benefits. Pine is perfect. Please don’t bare-foot walk where there might be snakes. I think the soles of barefoot walkers’ feet toughen up quite quickly, but not enough for snake bites!